eBay Untitled Document StoreAuctionsFollow us for more savings! 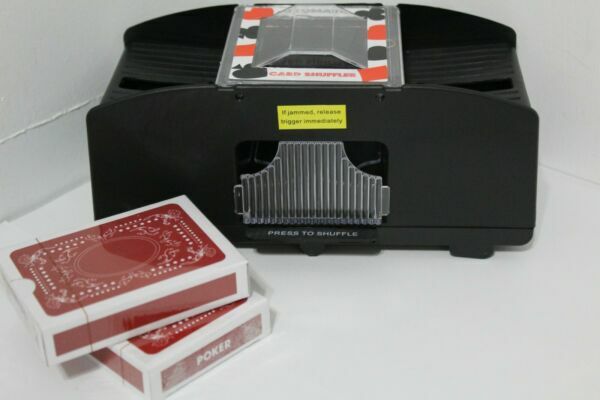 Wemco Electronic Card Shuffler with 2 Decks of Cards. Condition: New.Product Description:- Uses 4 AA batteries ( not included)- Quickly shuffles up to two decks at a time with a push of a button- includes 2 decks of playing cards and the electronic card shufflerFast and Free ShippingSHIPPINGAll items ship out within 1 business day, Monday-Friday(excluding holiday). Items purchased before Noon(CST) will ship out that day; items purchased after Noon will ship out the following morning (minus holidays and weekends).PAYMENTSWe accept PayPal. Auction payments must be made within 3 days of the auction end or else an unpaid item case will be opened.RETURNSReturns are accepted within 60 of the item being initially delivered. There will be a 10% restocking fee for items returned that do not fit the following criteria: defective item, incorrect item, error on the sellers part, or any other issue outside of the buyers control.